Seller: Fall Day Software Inc.
© Fall Day Software Inc. I really like this app. Have been using it for a longtime. Today I am having a problem emailing my grocery list and weekly menu. It is not sending. Love this app and use it every single day! It is perfect for my family. This is the best app I have on my iPhone! This app has streamlined my family meal planning on Sundays. Meal planning now takes 5 mins instead of hours. Because of his app I don’t dread meal planning anymore. Also the best part is that I can upload the groceries list to my reminders. I share my reminders with my husband and he is able to do all the shopping based on my list. Seriously the best app! The low ratings could be that it’s not very user friendly. May be more tutorials. I like this app very much. It’s a simple meal planner and grocery list creation tool. I didn’t want something to create meals for me but for me to be able to plan out the meals I already have on paper. It does that part great! The one thing I wish the app had was an online interface so that I can use a mouse and keyboard to creat my meals and such. Highly recommend if you are looking for a simple meal planning app. All-in-one Planning and Shopping - Outstanding! Three words: Simple. User-friendly. Smart. Outstanding! Cannot fog urge out how to add food items to list. No instructions and difficult to figure out. Still cannot. Such a good app--just what I was looking for. I wanted a meal planner that could import recipes from a wide range of websites and this one fills the bill. Easy and fun to use. The Grocery List is awesome. The app is great but there are a couple of bugs I've come across. The worst is editing ingredients/cart items. On the iPad mini 2 I have to make a change to the name, hit done, then go back in and change the qty, then done , then go back in again to change the aisle. You can't do all three at once. Worthless app to me. I got it because of the Apple Watch integration but it doesn't sync correctly. Half of the items don't show up and it doesn't sync when you check things off. I may be asking for my money back because it is worthless to me. I really like being able to search for recipes online. It does take a little bit of work and getting used to but it's totally worth it! If I weren't married, I'd rate this app at 3-4 stars. But I am and for a menu plan and grocery list app to work for our family it has to sync between mine and my wife's phones and we couldn't get it to work, though either syncing option (Dropbox or iCloud). Disappointing since I liked the app. Back to seeking an alternative. I make meal plan for weight control purposes and this app is perfect! I can add food I eat to the database and delete ones I don't use. This gives me a portable version of my planned meals whenever I need them for reference. Each update has improved the ease of using it and response when you contact the developer is awesome! So glad I found this app!!! The style of this app is wonderful and I love that it creates a grocery list for you, but I need to be able to create more than 5 meals. I wish there was an option for more than 5 meals, hopefully that will be an upgrade because I feel as if it should be offered anyone because it's a paid for app. Love this app. They even have an option for Siri support! This is exactly how I create my weekly menu on paper! Now each week is saved. I particularly love the wand feature. Now after a few entries the app shuffles things up for me. LOVE IT! Could use a help button to explain how it works. But fairly easy to figure out on your own. Title says it all. You have been warned! Just spent $4 on an app that will list the meal, but I found no where to enter the instructions for cooking it. If I wanted just menu planner and grocery list, I could do that on paper. I was looking for an app that would show the menu for the week, list the ingredients needed and show the "how to" cook the meal all in one place. I love this for weekly grocery planning and organizing. Would give it 5 stars if the notes would print with the meals. It's not perfect, but it comes close. One major improvement that could be made is to allow bookmarks of favorite recipe websites. I have my favorite websites I use regularly and repeatedly need to type in the name as there is not a "memory" of past websites used. It would also be nice if the app allowed for a copy of the recipe to be stored, as it's not always feasible to have Internet access when I use this app. Overall though, it's been a great help with meal planning! After a little playing to figure it out I love it! Can add groceries from Siri and it syncs with all my devices. It's easy to pull in recipes from online. A little more time consuming to add my own. But overall this has helped me organize and end up more efficient at the store and no more wondering what to eat! What have you done. I hate this. I would like to see a calorie count for each meal. Nice idea, however just as the previous user said, it would be better if it can show the whole month. They choose not to have their star rating visible for obvious reason. It's difficult to add new items. Just don't buy this, find something more user friendly and less deceptive. This app does not have the flexibility to really plan meals unless you cook using recipes-which I don't. While, if you are patient enough to type in your own recipes, OR if you experiment with on line recipes (which I don't)it probably would work fine. IF like me you are looking for a digital chalkboard to plan your week of simple meals in a weekly format that would give you a shopping list section to type in yourself THIS IS NOT IT. Sorry I wasted the money. I'm really loving this app. I am able to plan meals, upload a recipe or link to a website and get a grocery list. 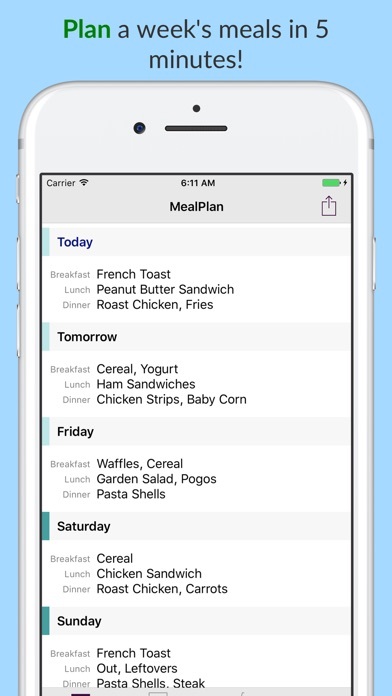 The only thing right now is I would love to see days that have a planned meal highlighted in a different color than days without any plans. Just so the planned meals jump at me at a glance. I regret to purchase this. It's complicate and don't let me add nothing..
Love this app, it is very easy to use. I like that you can even search recipes online and add them to plan and grocery list. Only thing I would like to see is being able to add my own recipies. I was very disappointed by the lack of instructions and the bad design. The program is not user friendly and has many glitches. I’m disappointed that I paid money for this and I can’t get it back. We invested a lot of time and energy into meal plans and recipes only to discover that syncing over iCloud doesn't work and the dropbox syncing is completely unreliable. It's a real bummer. 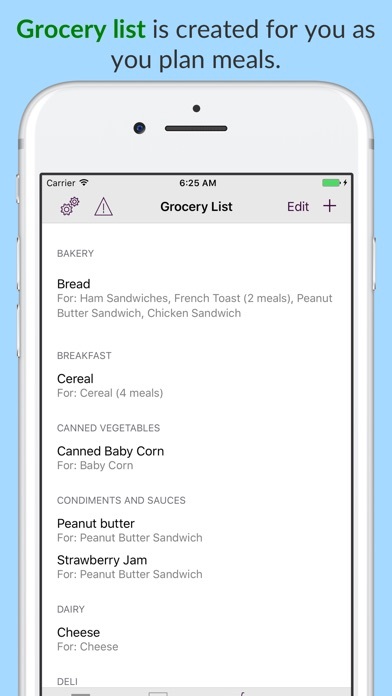 This app doesn't track what's in the pantry and it's not easy to add your own items/recipes. I've found that I need to use another app. This is the perfect meal planning app! What I love most about this app is the ability to pop in any URL for a recipe, and it automatically imports all of the ingredients you need, along with saving the webpage for that meal so that you have directions, etc. at hand. 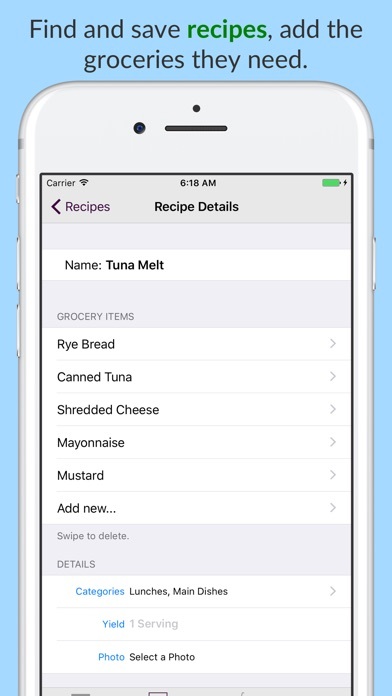 Other apps force you to add each individual ingredient by hand. It's such a time saver! I'm so glad I found this. It will make my life ten times easier, and I love having all of our favorite meals stored and organized in one place. All I wanted to do was to add grilled cheese, but the only way was to find a recipe online to add a simple item. Pls make the Add new item a bit easier with the option to add recipe if needed. This is an easy to use tool that is easy to use, configurable, supports multiple devices, syncs across devices, imports recipes, etc. I've been searching for a app where I can log all my meals beforehand. This app does it! I can do it for the weak or month!! It's great because all I have to do is open the app and my meal is already there. I prepare all my meals 1 week before, and sometimes I may get confused but all I have to do is look ok at my meal calendar and there it is!! What is also great is that I log everything in on my iPad and it syncs to my phone!! Very simple!! I would recommend! Great app! A lot of thought into design and options. Flexible inputs for meal planning and shopping. You won't be disappointed. It has crashed 3 times in 2 minutes. I can't even type a word. I want my money back please! My wife and I be looking for a good meal planner for ever and tried numerous ones without success. At first she refused to pay four dollars for the purchase of this app and we had already spent considerable amount of time researching a good one. I said f@&% it I'm going to download it, and our journey began. This app is incredible, we plan our week and it added our groceries and even pulled the shopping list for my recipes what more can you ask for we synced it with dropbox and we're off to the store! As busy professionals it helps to know exactly what we are cooking and when. No more expensive last minute take-out. We are in love! Now for a watch app ;]. I love this app. It does take a little bit of work to get ingredients in for recipes, but once they are entered and you have that meal scheduled it adds the ingredients to the grocery list. Great upgrade on linking to recipes as well. 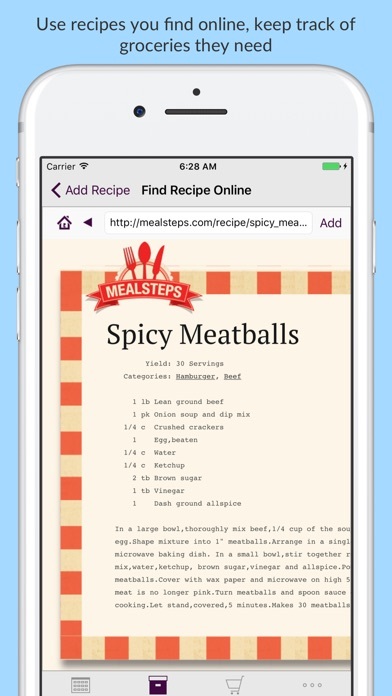 I can find recipes online and add them to my list, then when ready to make that meal, can automatically bring up that recipe in MealPlan. This has saved me lots of time from my old paper routine. This app is alright. I would not say it is the best. A couple of things that would make it better would having the choice making the calendar to see the whole month. And having a choice to have reminders. I've loved using this app for not only storing my favorite recipes but also planning out my meals for the week(+). However, I do wish it was somehow easier to follow the recipes step-by-step in a "viewable/cookbook-style" option when cooking instead of having to open up the recipe in an "edit" page. I somehow overlooked that this app does not actually store recipes. I totally wasted my money. DO NOT BUY THIS APP. YOU ARE BETTER OFF WITH A PENCIL AND A NOTEBOOK. $3.99 DOWN DRAIN!!! After looking at several apps to replace our index card system of planning out what we’d eat for the week I chose this app. Unfortunately it is not easy to use and trying to link Pinterest so we could use the recipes we have there the only way to link it was just the Pinterest site itself.